Trump's $4 Trillion Budget Helps Move Deficit Sharply Higher - Integration Through Media ....! 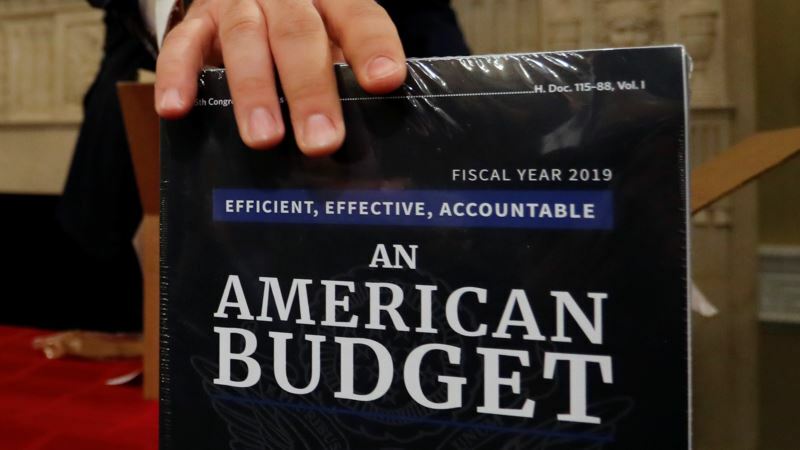 (VOA): President Donald Trump is proposing a $4 trillion-plus budget for next year that projects a $1 trillion or so federal deficit and — unlike the plan he released last year — never comes close to promising a balanced federal ledger even after 10 years. And that's before last week's $300 billion budget pact is added this year and next, showering both the Pentagon and domestic agencies with big increases. The spending spree, along with last year's tax cuts, has the deficit moving sharply higher with Republicans in control of Washington. The original plan was for Trump's new budget to slash domestic agencies even further than last year's proposal, but instead it will land in Congress three days after he signed a two-year spending agreement that wholly rewrites both last year's budget and the one to be released Monday. The 2019 budget was originally designed to double down on last year's proposals to slash foreign aid, the Environmental Protection Agency, home heating assistance and other nondefense programs funded by Congress each year. "A lot of presidents' budgets are ignored. But I would expect this one to be completely irrelevant and totally ignored," said Jason Furman, a top economic adviser to President Barack Obama. "In fact, Congress passed a law week that basically undid the budget before it was even submitted." In a preview of the 2019 budget, the White House on Sunday focused on Trump's $1.5 trillion plan for the nation's crumbling infrastructure. He also will ask for a $13 billion increase over two years for opioid prevention, treatment and long-term recovery. A request of $23 billion for border security, including $18 billion for a wall along the U.S.-Mexico border and money for more detention beds for detained immigrants, is part of the budget, too. Trump would again spare Social Security retirement benefits and Medicare as he promised during the 2016 campaign. And while his plan would reprise last year's attempt to scuttle the "Obamacare" health law and sharply cut back the Medicaid program for the elderly, poor and disabled, Trump's allies on Capitol Hill have signaled there's no interest in tackling hot-button health issues during an election year. Instead, the new budget deal and last year's tax cuts herald the return of trillion dollar-plus deficits. Last year, Trump's budget predicted a $526 billion budget deficit for the 2019 fiscal year starting Oct. 1; instead, it's set to easily exceed $1 trillion once the cost of the new spending pact and the tax cuts are added to Congressional Budget Office projections. Mick Mulvaney, the former tea party congressman who runs the White House budget office, said Sunday that Trump's new budget, if implemented, would tame the deficit over time. "The budget does bend the trajectory down, it does move us back towards balance. It does get us away from trillion-dollar deficits," Mulvaney said on "Fox News Sunday." "Just because this deal was signed does not mean the future is written in stone. We do have a chance still to change the trajectory. And that is what the budget will show tomorrow," he said. Last year, Trump's budget projected a slight surplus after a decade, but critics said it relied on an enormous accounting gimmick — double counting a 10-year, $2 trillion surge in revenues from the economic benefits of "tax reform." Now that tax reform has passed, the math trick can't be used, and the Trump plan doesn't come close to balancing. But critics are likely to say this year's Trump plan, which promises 3 percent growth, continuing low inflation, and low interest yields on U.S. Treasury bills despite a flood of new borrowing, underestimates the mounting cost of financing the government's $20 trillion-plus debt. The White House is putting focus this year on Trump's long-overdue plan to boost spending on the nation's crumbling infrastructure. The plan would put up $200 billion in federal money over the next 10 years to leverage $1.5 trillion in infrastructure spending, relying on state and local governments and the private sector to contribute the bulk of the funding. Critics contend the infrastructure plan will fail to reach its goals without more federal support. Proposals to streamline the permitting process as a way to reduce the cost of projects have already generated opposition from environmental groups. Presidential budgets tend to reprise many of the same elements year after year. While details aren't out yet, Trump's budget is likely to curb crop insurance costs, cut student loan subsidies, reduce pension benefits for federal workers, and cut food stamps, among other proposals.